In the 20th century the name of Diego Rivera was recognized by more people in Latin America than that of any other artist, and he has been called the most famous Mexican artist in the world. 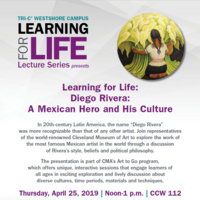 Join representatives of the world renowned Cleveland Museum of Art to explore the work of Diego Rivera through a discussion of the artists style, beliefs, and political philosophy. The presentation is part of CMA’s Art to Go program which offers interactive sessions through a unique hands-on experience, engaging learners of all ages in exciting exploration and lively discussion about diverse cultures, time periods, materials, and techniques. The details regarding some Mexican hero. The details are giving a good view of the person. The post like this is good for understanding various peoples in the world with various importance http://www.radiantcutbaguettes.com/ . The details are helping to know about the event and other details.